So is Limp Bizkit Going to Play a Show at the Sunoco in Dayton Tonight, Or What? A year ago, I reached the pinnacle of my journalistic career: publicizing a Limp Bizkit concert that never happened. Allow me to explain… around this time last year, it was announced that rapper 50 Cent was coming to Dayton, Ohio—not for a concert, but to sign bottles of vodka at a nearby liquor store. 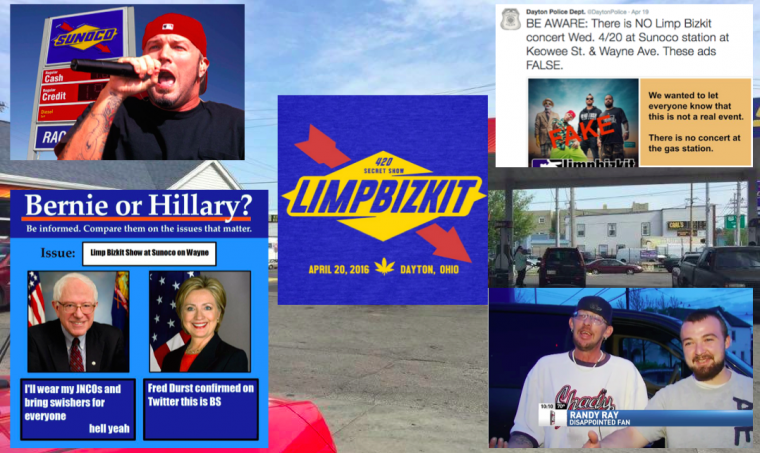 This hilariously pitiful confluence of washed-up pop star and low-rent venue inspired some local pranksters to create a Facebook event page for a “secret 4/20 show” that was supposedly being played by Limp Bizkit on April 20th at a Sunoco gas station downtown. From there, the joke took on a life of its own, with the story being picked up by international media outlets and leading to an explosion of memes. When the night of April 20, 2016 arrived, so many people showed up at the Sunoco that they actually managed to shut the gas station down. Afterwards, I wrote an article documenting my own experience attending the “noncert.” Then, for a few weeks afterwards, I watched with amusement as copycat Facebook event pages for similar fake shows started popping up all across the Midwest, from an Eminem concert at a Raising Cain’s in Cincinnati, to a Third Eye Blind performance at the LensCrafters in Merrillville, Indiana. And then, after a while, the whole thing died down. Looking back now, I feel that in some ways, my Sunoco story was the original “fake news.” In fact, whenever the gag is revived nowadays, it is usually done so in reference to the sort of brazen falsehoods that have become commonplace in our current political moment. For the most part, though, the concert that never was has receded from memory; consigned to the dustbin of forgotten internet memes, where it shares space with the doomed flight of airline pilot Sum Ting Wong and the quixotic presidential campaign of Independent candidate Deez Nuts. There is one small but crucial detail, however, that has also been forgotten over time: the Facebook event page never actually said that the concert was happening on April 20, 2016, but rather one year from then, on April 20, 2017. Which, of course, is today. Which raises the question… so, are we doin’ this? A year ago, the idea of Limp Bizkit playing a concert at an Ohio gas station was played as a joke. But in the 365 days that followed, the city of Cleveland earned a major sports title, the Chicago Cubs won the World Series, and Donald Trump became president of the United States—three major occurrences which all once appeared laughably improbable, yet somehow managed to materialize, and in doing so, seemed to make a lot of people in the Midwest very happy. 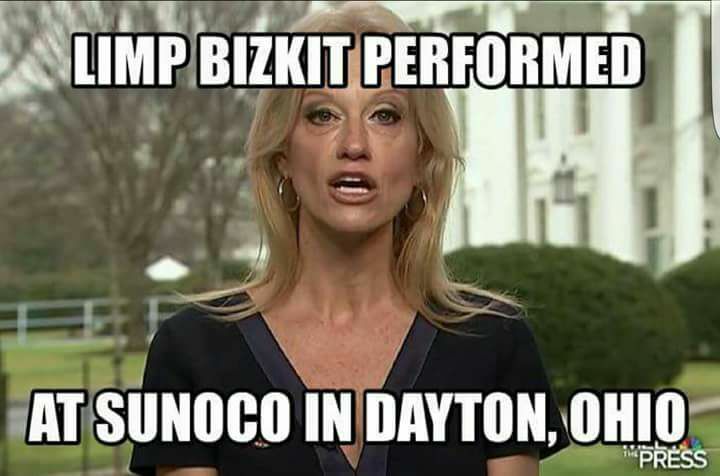 Wouldn’t a free, impromptu Bizkit show performed before throngs of ironically adoring fans at a Dayton gas station fit neatly within that trend? And if Sunoco’s marketing team actually embraced the whole meme and agreed to have their Dayton location host the event, wouldn’t that be in keeping with the ways in which corporate brands now attempt to capitalize on their own self-awareness and social media savvy? And didn’t Fred Durst himself seem to delight in his band’s temporary return to relevancy, and even hint that he might follow through with an honest-to-god, real, live concert? So tonight, why not grab a six-pack of Surge, a bottle of MD 20/20, and whatever blunt instrument you prefer using to break stuff, and drive on over to the Sunoco on Wayne Avenue (the one by Xenia Ave, not the one across from Kroger)? Sure, neither Limp Bizkit nor Sunoco has said anything about the concert happening—but it’s a “secret 4/20 show,” so of course they’re not gonna snitch! Plus, everyone on the original Facebook event page—which now has over 9,000 people RSVPing—seems pretty convinced that it’s happening for real this time. So please do it, Fred. Do it for the internet, do it for the fans, do it for the lulz, and yes, do it for the nookie. Do it all for the nookie.